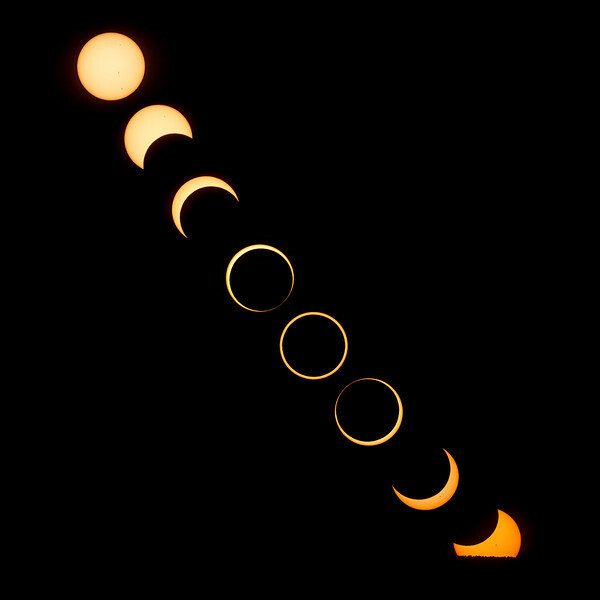 Here we see phases of the annular eclipse as the sunset advances (note the increasingly warm color of the sun). I met up with longtime flickr friend Steve Lefkovits (aka Pacific Landscapes) and a few new friends at the Navajo Nation near Canyon de Chelly, AZ. Our location put us within a mere couple thousand feet of the center line for the eclipse, in my mind we had some of the best seats on the planet to enjoy the show! Image Notes: This is obviously a composite of multiple frames. The full sun was taken at the hotel in Chinle before we left for our shooting location (about an hour before the eclipse began). The sun set before it could come completely out of eclipse, this fact lent gorgeous sunset colors to the sun as it set creating a unique graduation of colors for the event. I used my Nikon D300 paired with a Sigma 100-300 F4 mated to a 1.4x teleconverter with solar mylar film to protect the camera sensor. I used an actual arc of the setting sun to place the suns on the composite so that they reflect how the sun actually set. Thanks to Steve and crew for a terrific eclipse trip!